...don't you know there are starving kids in China?" Dear Winter, I am so over you. Gosh I love complaining sometimes. It calms the nerves. So much easier than just changing my outlook. And even tho I haven't benefited from the awesome upper body workouts my friends to the north have this winter (booyah on the upcoming killer tank top arms! ), I kinda feel I'm bonding with youse guys over our shared hatreds and grievances. Right? After all, I might not have the quantity of snow as some, but then again...I don't have the benefit of all the quantity of photo ops either. Just the plunging temps, the ice rink in my garage, and the arms that could use a good spring tune-up. Trying to look on the bright side. One spilled pot of beans at a time. Lord help me. Next Tuesday's Song-ography title suggestion is "I Lived" by One Republic. Royals pitchers & catchers report tomorrow. & I'm ready. I'm ready to put my plants back out on the porch & to be there enjoying that space. We have no snow, no ice. Just these cold temps. Seems like there ought to be something to show for it. 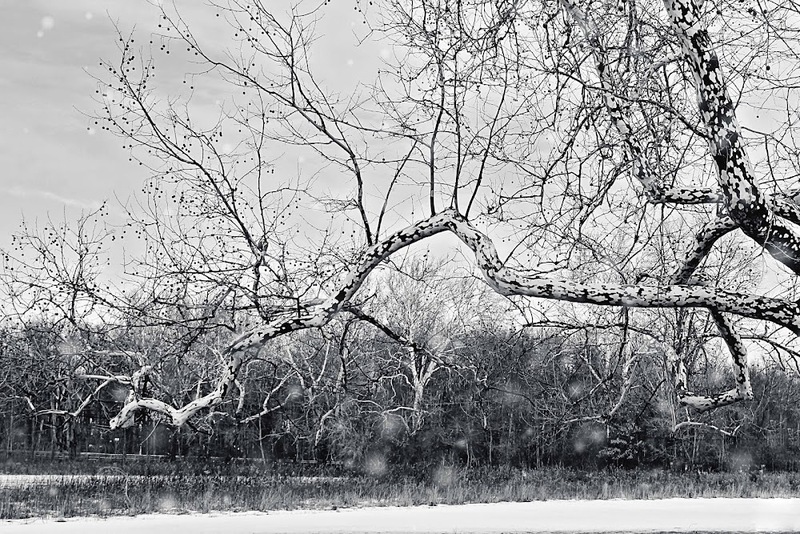 Lovely photography in BW ~ and I agree ~ 'am so over winter'. "it's not you, it's me ... naw, it's you" - yep, had that conversation with the weather myself. I was momentarily embarrassed at the whimper of how much snow we had received when talking to my daughter (who is in Boston - walking to and from work and classes - apparently uphill both directions ...) but then I remember all the whining I have endured from her over the years and considered it a fair exchange. I love me my snow and winter - but I kinda want normal back in Boston!! I don't think I have ever been more ready for spring and I usually love winter. And we haven't even had that much snow this year. Fabulous picture I really love the detail and the pattern on the bark. We are blessed in Texas. We seldom even get snow. This is the worst snow storms I believe I have ever seen. Stay warm and inside if possible. Now Eeyore is really looking on the bright side. More snow due her tonight. "Oh bother!" but look at that gorgeous shot!!! wow. Its only February Kathy, hang in there. It's times like these that I'm glad our house moves.. Stay warm.. It's time for Ole' Man Winter to vacate the premisses, and I hope Spring does not go on Spring Break for 3 weeks like it did last year. Ugh....oh, bother! I am right along side ya sista! Only my spilled beans, were the gallon of milk that I dropped on the porch floor between said garage & kitchen. So I have frozen milk to cry/complain over & can hardly wait for the spring thaw & the smell that may accompany the thawing of what milk I was able to mop up. I know it is only February but I am so tired of snow ( despite the exercise my upper arms get from shovelling). Weekend forecast : Snow tomorrow, followed by rain on Saturday ! Really ? Get me out of here! By the way; a most wonderful picture ! I like the composition of that photograph very much. Beautiful shot-hope it warms up for you soon!!! I don't feel that I can complain at all with not one flake of snow yet to fall, but I'm catching up to you in the over it department. The limb is amazing! Great photo, perfect title, and I am so right there with you. I try not to complain about the weather, but this winter I'm wondering, will it ever end? I am so over winter too.